All transactions are safe and secure with a reliable history in online purchasing behind each of our associates. 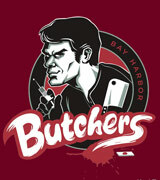 Buy the Bay Harbor Butchers t-shirt to own Dexter clothing and merchandise. In season two, Dexter's life is complicated with the discovery of his ocean burial location. As bodies and body parts are removed, the media goes crazy, dubbing the newest serial killer the Bay Harbor Butcher. As if Dexter's life weren't complicated enough, he now contends with his evidence being unearthed. Reel in this Dexter Bay Harbor Butcher t-shirt to commemorate Dex's new alias. In addition to the Bay Harbor Butchers tee above, browse the Dexter Clothing Gallery for more apparel like men's and women's clothes, kids shirts or hoodies.